Two Springwood High School students have won scholarships that will assist them through to the completion of their HSC. 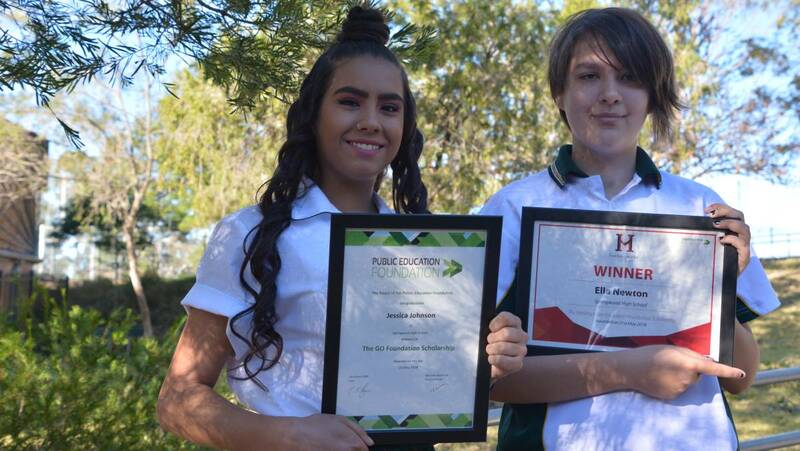 Jessica Johnson, 16, and Ella Newton, 15, were recognised at a Public Education Foundation Awards ceremony in Sydney on May 21. Jessica won the Go Foundation Scholarship, founded by Adam Goodes and Michael O’Loughlin, which aims to empower Indigenous Australian youth to change their own lives, and to support them in doing so on their journey from school to employment. Jessica had a difficult home life for many years and now lives with her brother and his wife and rarely misses a day of school. The two-year $10,000 scholarship will help provide Jessica with study materials and a desk to work at at home. She is keen to do well in school so she can attend university and eventually help others. “I want to be a social worker because I like to help people and help kids out and show them that it does get better in the end,” Jessica said. Ella was awarded the two-year Harding Miller Education Foundation Scholarship. Founded on the passionate belief that the education and success of girls will lead to a more prosperous and responsible society, this scholarship supports and enables girls to achieve their full educational potential. Ella also had a difficult home life, and said the scholarship was helpful because it has provided tutoring sessions and a laptop with internet access. “It’s made things a lot easier. Before I had to do all my school work at school,” she said. Principal Mark Howie said, “At Springwood High School, we strive to be a school for all, making every effort to provide a first–class comprehensive education for our students, in a school that is proudly inclusive in its values and wide-ranging it its curriculum, programs and practices.